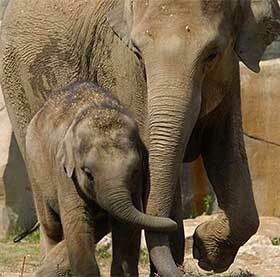 EEHVINFO.ORG IS HERE TO PROVIDE PEER-REVIEWED, ACCURATE INFORMATION THAT REFLECTS CURRENT THINKING ON THE RESEARCH AND MANAGEMENT OF EEHV IN BOTH WILD AND CAPTIVE ELEPHANTS GLOBALLY. It can only work with the input from active EEHV researchers and clinicians, including but not limited to members of the EEHV Advisory Group. We are grateful to all the busy scientists and veterinarians who have contributed their expertise to the site, and plan to continue to update the content regularly as new discoveries are made. www.eehvinfo.org is your website and we are willing to consider any relevant submissions that you feel are worthwhile. Any submissions will be peer reviewed by designated experts in the applicable field. Contact Erin Latimer for questions or to submit ideas for content. Jill Allread, Public Communications, Inc. Contact information for the EEHV Adv Group members can be found HERE. Please note: Page is restricted access by Members Password. The Steering Committee will assist in guiding the direction of this mission. Instructions for interested researchers to gain EEHV Advisory Group support can be found HERE. A letter can be given providing support for the project from the EEHV Advisory Group. This letter of support may signify that the project is feasible, scientifically sound, and aligns with the EEH Advisory Group research priorities. It does not guarantee funding or that samples will be provided.